A series of impressive performances, China emerged dominant as play in the lower half of the draw in the first round of the Women’s Singles event at the Seamaster ITTF World Tour 2018 Platinum German Open came to a conclusion on the afternoon of Friday 23rd March. Required to compete in the three day qualification tournament, Fan Siqi, Sung Yingsha, Wen Jia and Wu Yang all emerged successful but prior to the start of the round was compatriot, Chen Xingtong, the no.9 seed, the player who faced the greatest challenge? She confronted colleague Mu Zi, bronze medallist at the Qoros 2016 World Championships in Suzhou, an achievement that only one player in the whole event could match; last year in Düsseldorf at the Liebherr 2017 World Championships, Miu Hirano, in the top half of the draw in Bremen, had likewise stood proudly on the third step of the podium. Most impressively Chen Xingtong accounted for Mu Zi, a qualifier, in four straight games (11-5, 11-6, 11-8, 11-6). Impressive from the very active Chen Xingtong, it was the same from her colleagues with Fan Siqi and Sun Yingsha ending the hopes of Hong Kong. Fan Siqi beat Doo Hoi Kem, the no.6 seed (11-7, 8-11, 11-6, 11-8, 11-9); Sun Yingsha accounted for Lee Ho Ching, the no.10 seed (11-8, 11-7, 11-8, 11-7). 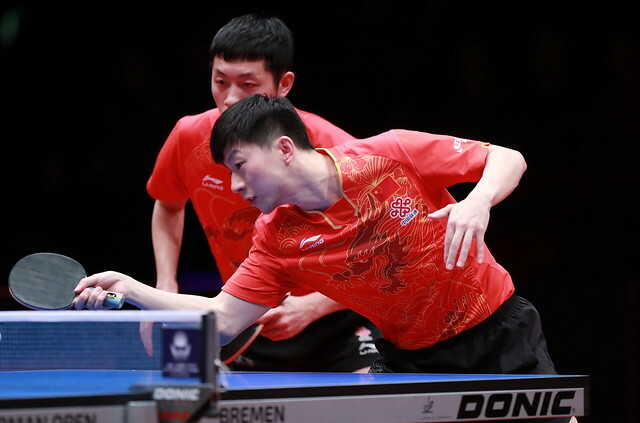 A noteworthy performance from Wu Yang, it was the same from Chinese Taipei’s Cheng I-Ching it was from the Japanese duo of Kasumi Ishikawa and Mima Ito; all three beat players who had been required to compete in the qualification tournament. Kasumi Ishikawa, the no.2 seed, accounted for colleague, Hitomo Sato (11-5, 11-6, 11-6, 11-7), Mima Ito, the no.3 seed, overcame Britt Eerland of the Netherlands (11-8. 11-7, 9-11, 12-10, 11-8); Cheng I-Ching, the no.5 seed, ended the hopes of Saki Shibata, also from Japan (11-3, 3-11, 13-11, 11-7, 11-9). Play in the second round of the Women’s Singles event takes place later in the evening.